Electric car drivers in the capital of Norway must now pay for charging. Oslo has started the conversion of about 1,300 public charging points in the city to be able to charge a fee. The aim is not so much to cash in but to keep EVs from parking for free without charging. 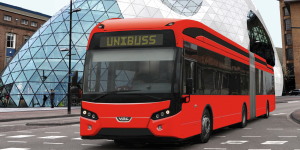 BYD will deliver the largest fleet of electric articulated buses in Europe to Oslo. 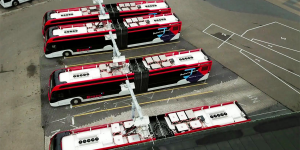 Two orders have been placed by Nobina for a total of 42 electric buses measuring a full 18 metres. 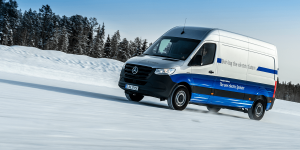 The orders follows multiple electric bus deliveries to Norway. Norway’s capital has taken the next step in its push for a zero emission transit system. Volvo received an order for 17 electric buses due to arrive in Oslo in summer 2019. They are part of a total of 70 all-electric buses various manufacturers share. VDL has received its largest bus order from Scandinavia to date and it comes from Oslo bus operator Unibuss. The Norwegian company carries the lion’s share of the electrification offensive underway in Norway’s capital. Oslo has announced the procurement of 70 new electric buses, which will take up service next year. The companies Unibus, Nobina and Norgesbuss will be operating the new vehicles on 13 bus lines in Oslo. 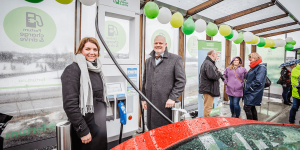 Fortum Charge & Drive has opened its first high power charging station in Norway. 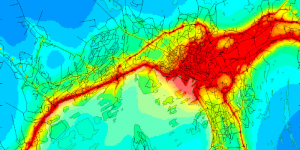 It marks the beginning of a HPC corridor through the Nordics that is to connect Oslo, Stockholm and Helsinki before the end of 2018 as a start. Norway firmly remains on top of global EV sales with electric cars now making up 5.1 per cent of all sales. Throughout 2017, 42.5% more BEV were sold compared to 2016 and there are 142,490 all-electric cars and vans on Norwegian roads to date with more being added every month. 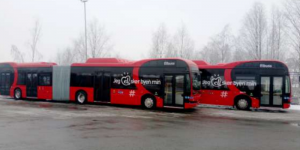 The first two articulated electric buses made by the Chinese manufacturer have been put into operation in Norway’s capital Oslo. 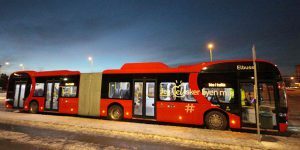 Bus company Nobina deploys both 18-metres models on line 31 and 31E, known as “Norway’s heaviest duty routes carrying around 50,000 a day”. Leclanché supplies batteries to Škoda Electric: In the framework of a 5 year development cooperation, Swiss manufacturer Leclanché will deliver its battery solutions for electric buses to Škoda Electric. Besides that, the partnership involves also battery systems for cars and off-road vehicles. Printed mini EV made in Taiwan: The Taiwan Automotive Research Consortium has introduced a small EV with elements from a 3D printer. With its lightweight construction, the two-seater is designed for city life requirements – that’s also why it just provides 60 kph and not more than a 6.6 battery pack for 100 km. Further information that would indicate commercial use have not yet been released. Volocopter to take off in 2017 in Dubai: State-owned traffic authority RTA entered into a deal with German company Volocopter in order to trial its autonomous electric air-taxi in the Emirate. The project covers 5 years and shall begin in the fourth quarter of this year. Autonomous electric buses in Oslo: From March 2018, the Norwegian capital will see autonomous mini buses users can order via app. In the long term, Oslo’s Roads and City Authority even considers to deploy 10 to 20 of those self-driving buses. Oslo, Opel Ampera-e, UK, Rheinmetall, Volvo, Asahi Kasei, GLM. Electric cabs only in Oslo? Norway’s capital may be next to move towards a diesel-free future as Oslo wants to eject all diesel taxis and allow electric ones only, Taxi Times reports. The cleanse could start by 2022 with the city council’s decision due by 2018 and a group for the transformation process been established already. It would be a regional regulation made possible by the Norwegian government’s decision to leave taxi transport rules to municipalities. Meanwhile, Norwegian civilians are taking deliveries of the Ampera-e aka the Chevy Bolt. Opel chose Norway’s national holiday to serve the first three customers and said there are another 4,000 orders awaiting fulfilment. Policy pledge on pollution: With the General Election in the UK on the horizon, opposition parties rush to swing voters and thus the Liberal Democrat manifesto promises a ban on sales of diesel cars from 2025. It is part of the party’s Green Transport Act, which also wants to increase electrification. Rheinmetall enters e-mobility: An order worth 100m dollars has reached mobility and military supplier Rheinmetall, which is to deliver electric motor housings over the next seven years. The commission comes from an unnamed but “globally operating German carmaker” who is to utilise the casings for cars build for the Chinese market. Consequently, production will take place at Rheinmetall’s Chinese subsidiary KPSNC in Shanghai from mid-2018. Volvo opens order book: The second-gen Volvo XC60 is now available in the USA, where it will hit the shelves this autumn. Prices for the top line T8 Twin Engine with a 400 hp PHEV system start from 52,900 dollars. Campaign concept vehicle: Japanese Asahi Kasei and GLM have come up with a three-seat electric SUV. The 225 kW concepts builds on GLM’s EV platform but will most likely never roll off a production line. Asahi Kasei rather sees the electric car as a vehicle to presents its materials and tech to OEMs. Audi, Oslo, Kia, Citroen, Chevy, Tesla. Five new e-trons for China: Audi and its Chinese joint venture partner signed off their 10-year strategic plan. Next to forming its own brand for mobility and digital services, the two companies are also planning to produce five more e-tron models in China, on top of the already scheduled A6 L e-tron und Q7 e-tron, and introduce them to the market there. That includes purely electric vehicles. Diesel-ban in Oslo: The Norwegian capital banned private diesel cars from its roads on Tuesday and Wednesday between the hours of 6 a.m. and 10 p.m. The ban could be extended. German magazine Der Spiegel reports that Oslo even wants kick all vehicles with combustion engines out of the inner city ring by 2024. Kia Stinger update: According to Auto Express, Kia could launch an all-electric version of the Kia Stinger GT, which it presented at the Detroit Motor Show. The sleek five-door GT would then rival the upcoming Tesla Model 3, but is not said to hit the road before 2019. But it could then be fitted with level 3 or 4 autonomous features. SUV Aircross as PHEV: Citroën wants to introduce its SUV Aircross to the Chinese market at the end of the year. It will also be available as a seven-seater, as well as a plug-in hybrid from 2018. Rollout plan: GM has published a rollout schedule for the Chevrolet Bolt in the U.S. The EV is currently only available at dealerships in California and Oregon, but can already be ordered in a total of seven states. By September, the Bolt will be available across the United States. Tesla referral programme: Tesla launched a new round of its referral programme until March 15th. Clients who successfully refer seven new buyers will receive two invitation to the Model 3 delivery event. Those who sell five vehicles get a limited-edition Powerwall and those with three successful referrals get a Model S for kids. Tesla also kicked off an annual awards programme. The first person to successfully refer 20 new buyers in each sales region – North America, Europe, or Asia Pacific – will get a Tesla Model S or X P100D. Tesla, Audi, VW, Oslo, Panasonic, Mahindra. Masterplan, Part 2 revealed: Elon Musk says the EV maker will also focus on creating solar roofs with integrated storage and that it is working on a Tesla Semi and “high passenger density urban transport,” both of which should be unveiled next year. The carmaker will also further develop its fully autonomous technology. Once in place, drivers can add their EV to a Tesla shared fleet that can be summoned by the touch of a button. 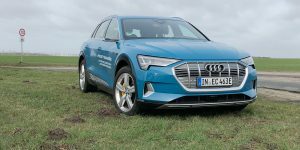 Audi focuses on H2: CEO Rupert Stadler confirmed that Audi will take over the lead in developing fuel cell technology within the VW Group. 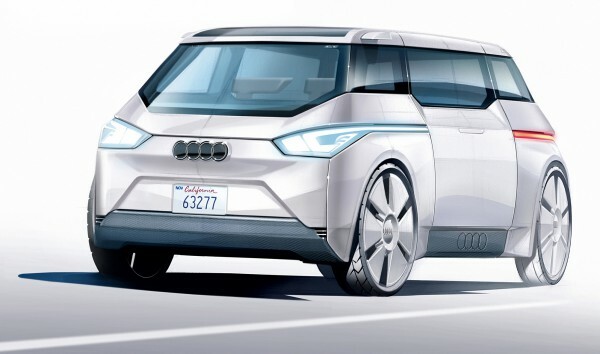 When Audi will release its first serial FCV remains unclear. The H-tron quattro concept had been previewed in January. Moreover, Rupert reemphasized the company’s goal that EVs should make up 25 percent of sales in ten years’ time. New Golf previewed: The eight generation will hit the road 2019 and also be available as a PHEV and electric variant. Two designs are still in the running, one with a more stretched silhouette, the other with a steeper tailgate. It will also serve as basis for the VW NUVe, also scheduled for 2019. Car-free step by step: Oslo has started redesigning the city centre, swapping car parks for food courts and theatres. The goal is to be almost entirely car-free by 2019. That also means that incentives for car owners are being scrapped and public transport improved. Panasonic job fair: The company is looking to hire a second wave of people for cell manufacturing at the Tesla Gigafactory in Nevada. Panasonic currently lists 42 job openings on its site. The job fair will take place on August 10th in Reno and will be Panasonic’s second hiring event in two months. Mahindra Scorpio becomes hybrid: So far, the Indian offroader was a mild hybrid at most, but will now be fitted with Intelli-Hybrid technology. Features such as recuperation and an electric motor that provides an extra boost are said to lower fuel consumption by 7 percent. 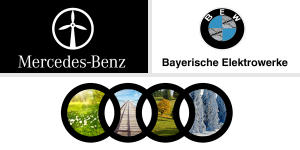 Audi, Volkswagen, BMW, Oslo, Mahindra, JBM Auto. Autonomous Audi City? The German carmaker will allegedly present an autonomous electric car at the Paris Motor Show this October, Auto Bild writes in its print edition. The Audi City concept will have neither a steering wheel nor pedals, but an all-wheel an electric drive. 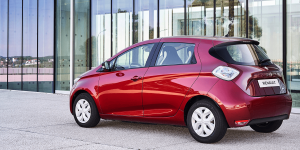 With a 90 degree steering angle, the compact four-seater is said to be able to parallel park all by itself. Family affair: VW confirms that the next-gen Tiguan SUV will father a new model family, including a long-wheelbase seven-seater next year and a coupé by 2018. The standard Tiguan already includes a plug-in hybrid version. Hybrid BMW Z5 confirmed: It has been confirmed that the Z4 successor will be a hybrid. The car is jointly developed with Toyota, who will deliver the hybrid system. Most other motor variants and the platform for the Z5 and Supra will come from BMW. The hybrid is said to deliver 400 hp. Acute measures: Oslo drives ahead its plan to ban diesel vehicles from the city center on days with high levels of pollutions. On acute days, the city will also close 1,174 city-operated parking places. Mahindra presents: The Indian carmaker brought three electric vehicles to the Auto Expo. 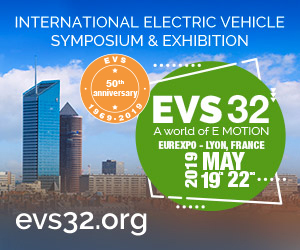 The E-Verito limousine is now in serial production, while the e20 EV becomes available as performance model. Entirely new is its Supro Electric that sits eight people. A first for India: The Ecolife has been dubbed the first electric bus for India by JBM Auto. The claim may cause for attention at the Auto Expo, but the bus was actually developed for India together with Solaris. It will be available as a nine and 12 metre version and the start of serial production is set for this year. VW, Turkey, Volvo, Oslo, DeLorean, Nissan. VW to delay electrification in China? The VW C-Coupe GTE, initially scheduled to launch in China in 2016, is postponed until early 2017. The PHEV concept was introduced at the Auto Shanghai earlier this year in a bid to start an electric offensive in the far east. Looks like the expansion has been set back on the agenda, electric or not, as Volkswagen tries to clean up its (diesel) act in the U.S. and in Europe. More EVs for Turkey: Turkey’s Hacettepe University in Ankara presents two electric cars. The EVT S1 prototype has 104 kW, weighs only 1,050 kg and can thus drive about 300 km on a single charge. 1,000 units are expected to be produced in the first batch. Yet, the university’s R&D zone Teknokent built a second prototype of a Smart-like EV named Teo accompanied by a drone called Avipod. 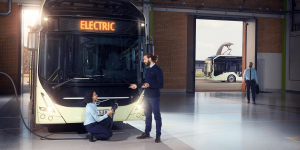 Serial electric bus: Volvo presents its new electric bus in 12-metre configuration for series production at the Busworld in Kortrijk, Belgium. The Volvo 7900 Electric has been tested successfully in Gothenburg since summer and is thus ready to launch in 2016. 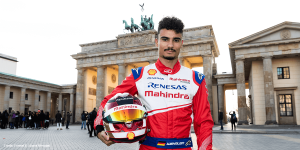 Energy and mobility belong together: Present your company in the Mobilitec sector at HANNOVER MESSE and demonstrate how integrated energy systems and modern mobility solutions are converging. Join 300 exhibiting companies and profit from the high level of attention this program generates. Oslo is to ban cars from its centre by 2019 as it looks to reduce greenhouse gases by 50% by 2020. Part of the plan is to build more bicycle lanes, subsidise the purchase of electric bicycles and reduce automobile traffic over the capital as a whole. No exemption for electric cars from the ban has been proposed, but the Norwegian vision sees EVs as the only remaining cars in the country comes 2030. Back to the future: Die hard fans of the cult movie starring Michael J. Fox as time traveller Marty McFly know that his arrival from the future is scheduled in two days. To make him feel welcome, Belfast’s Queen’s University updated the DeLorean DMC-12 as it converted it to electric. The future is now. Nissan Leaf review: Indeed, the new 30-kWh battery that provides the Leaf with 155 miles of range reduces range anxiety considerably. Yet, it does not make the electric car itself any more exciting but gives it a rather hefty price tag, British Mark Nichol finds. LA, Bern, Hitachi Capital, Oslo, ITM Power. LA electrifies: The city of Los Angeles wants to lease 160 all-electric cars and 128 plug-in hybrids in the coming months. Apart from reducing greenhouse gas emissions, the initiative is estimated to lower operating costs of the city’s fleet by 41 percent. The LAPD already received a Tesla Model S P85D and a BMW i3 in a full-fledged police outfit. Bern swaps diesel for hybrids: The Swiss capital has ordered 21 hybrid articulated Volvo buses, which will replace Bern’s current diesel buses and are scheduled to be delivered from mid-August to the end of October 2016. The new buses are said to drive all-electric around 30 percent of the time. Hitachi Capital teams up with Schneider Electric: In the UK, Schneider Electric and Hitachi Capital Vehicle Solutions have signed a five-year contract in order to provide complete charging solutions. The partnership aims to make Hitachi Capital’s customers feel more comfortable about choosing EVs. 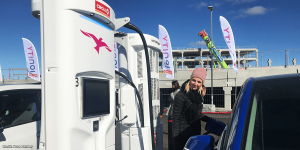 H2 on the fly: The Norwegian prime minister inaugurated a hydrogen fueling station at Oslo airport. Another three are scheduled to be built in the greater Oslo region over the next two to three years. 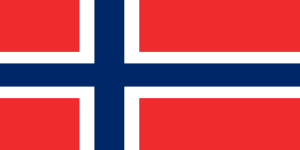 Norway wants to maintain a leading globally role in the adoption of hydrogen fuel. Fuel for all: ITM Power will deliver hydrogen filling stations to three Shell locations in the UK. These will be the first hydrogen stations on the premises of existing petrol stations in the country. China, Oslo, Ohio University, TransPower, University of Texas. Tesla expands in China: Tesla announced that it will establish seven supercharging networks in major cities and popular travel destinations in the second half of this year. The new superchargers will be installed in the Yangtze River Delta, Beijing-Tianjin-Hebei region and at Mount Huangshan. Ohio University gets charging: A total of 10 charging stations will be installed on campus before the end of summer. Two of them will be earmarked for a car-sharing program provided by the university, while the other eight will be available for charging EVs of students and employees. Electric school bus: TransPower is retrofitting six Californian diesel-powered school buses with electric motors that will go into service this autumn in the Torrance Unified School District in Southern and Napa Valley District in Northern California. The buses will also be able to feed energy back into the grid. University of Texas also plugs in: Telefonix has installed six of its Level 2 PowerPost chargers at the University of Texas MD Anderson Cancer Centre. The installation is also a symbol since according to the centre, improving air quality through the use of zero-emission cars could help prevent cancer. Hyundai, Kia, Oslo, FOMM, Zero Motorcycles, Chevrolet. Hyundai plug-in near: The Sonata plug-in hybrid is set to hit its home market already this July, the Korean carmaker announced. It would thus coincide with the newly expanded subsidies that now also include PHEVs (we reported). Nothing has been said on when the hybrid model will be exported. Kia’s very own hybrid: New spy shots have emerged, showing a heavily camouflaged Kia PHEV dubbed the “Prius fighter,” as it is the brand’s first plug-in hybrid solely designed to be (partially) electric. The new pictures show the upcoming Kia as a crossover rather than a limousine. Bad days for diesel: Diesel vehicles will be banned from Oslo’s roads if the Norwegian capital suffers from two consecutive days of high air pollution, city council says. Each ban has to be approved by the NPRA (Norwegian Public Roads Administration), while emergency, delivery and other vehicles will be exempt. JV partner wanted: Japanese FOMM (First One Mile Mobility) has developed a prototype of a small EV to be made in Thailand, where it is now looking for partners to set up production. The electric city car is set to launch in 2017 and might make it to Europe in the future as it complies with the L7e standard. Cheaper electric motorcycles: Zero Motorcycles says is cutting the price of its whole 2015 range of electric motorcycles by 1,350 dollars in the U.S. The reason is not low demand but lower battery costs, which the company wants its customers to benefit from, too. 2016 Volt pricing: Chevrolet has announced the price for the upcoming next-gen Volt for Canada, where it will be available from 38,390 dollars (MSRP) plus a 1,600 dollar destination freight charge, bringing the total up to 39,990 CAD (32,800 USD). This means GM is making its new Volt only slightly cheaper (105 CAD) than the outgoing model. Oslo, Denmark, BYD, Electric Vehicles InMotion, London. 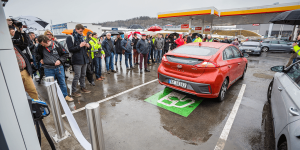 Oslo Airport EV ready: Norway’s EV fever has now reached the capital’s airport. An increasing number of travellers reach the airport in electric vehicles, which is why it will triple the number of park and charge spaces. The first 74 outlets are already ready for operation, another 50 will follow in September. Denmark gets Supercharger: Tesla installed its first Supercharger station in Denmark. Four charge points are from now on available to Model S drivers in the city of Middelfart, not far from Odense. BYD good to go: The Chinese company said its 12-metre electric bus has passed the U.S. government’s structural testing programme in Altoona, Pennsylvania. An 18-metre model will have to undergo the same testing procedure before it can be sold in the States. Electric Vehicles InMotion: This is the name of a new programme offering firms in South Yorkshire, UK, the chance to lease electric cars. The scheme uses all available government grants to keep rates low. A Nissan Leaf can be leased from 212 pounds (355 dollars) a month, Renault’s entire Z.E range and the Zoe are available at similar prices. Congestion charge to be raised: People driving into London’s centre with combustion engines will now have to pay 11.50 pounds per day (19.25 dollars), instead of the previously 10-pound daily fee (16.74 dollars). The new pricing will go into effect on June 16th, and is the first price increase since 2011. WAVE Rally 2014, Q&A with Elon Musk and JB Straubel in Oslo. Event tip: The ‘World Advanced Vehicle Expedition’ or WAVE Rally 2014 is said to be even bigger than last year’s event. With 305 electric cars rolling through Zurich and setting an official Guinness record last year, we wonder how big it will get this time. 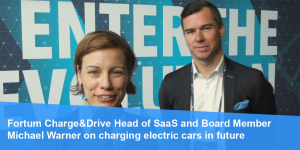 Video tip: Almost two weeks ago Tesla’s Elon Musk and JT Straubel were travelling Europe (we reported) to talk directly to customers and reveal more details of Model S leasing and supercharging. Follow the link to watch a recording of their ‘gig’ in Oslo, Europe’s unofficial EV capital.